At union meetings during the conflict, villagers asked activists to lobby the government to establish more accessible high schools so that poor children could attend school. When this approach seemed unlikely to succeed, the activists suggested that the village establish its own school, in facilities provided by the local pesantren. Most of the villagers in the hillside hamlet of Sari Mukti in Garut, West Java, are very small landholders or landless day-laborers, growing and harvesting cabbages, potatoes, and tomatoes on land belonging to someone else. Depending on their age and gender, they are paid between Rp 8,000 to Rp 15,000 for a day’s work in the fields – less than two dollars a day. Cultivation of the dry, rocky land in the hills is both labor-intensive and capital-intensive. In the area around Sari Mukti, vegetable production employs almost 300 workers per day per hectare. The cultivation of land requires significant outlays for fertilizer and pesticides. The price of the day-laborers’ crops is extremely unstable. In 2003, the first year that the Sururon School opened, the price of tomatoes fell from Rp 4,500 per kilo in January to Rp 200 per kilo in July. The distribution of land in the area is uneven, with a small number of larger land holders and state and private companies owning large patches of production and protected forest. In Sari Mukti, one family alone owns 56 hectares of land, in a plantation employing 160 workers. On the border of the village are huge stretches of forest claimed by the State Forest Corporation (SFC). Ownership of this land is hotly debated. Since 2000, villages have cleared and cultivated more than 300 hectares of it, claiming traditional and customary rights of ownership, which has brought them into protracted conflict with the corporation. The dispute reached a climax in August and September of 2003. At this time, the West Java regional police, a mobile brigade unit, the Garut police, the SFC officials, and officials of the Regional Natural Resource Conservation Bureau conducted a joint operation to evict day-laborers from production forests, protected forests, and conservation areas that they had occupied for years. On 12 August 2003, officials armed with rifles, pistols, and local maps set up tents in the areas around Sari Mukti. In the evictions and protests that followed, more than 600 local residents were detained. During the conflict with the State Forest Corporation, the residents of the areas had organized themselves into local farmers groups with the support of the Sundanese Day-Laborers’ Union, an organization advocating land reform and redistribution on large plantations and state forests. During many union meetings involving both the farmers from the district and activists from across Garut, an issue that was constantly raised was that local farmers simply didn’t have the education and knowledge they needed to organize themselves. They didn’t understand legal and official procedures and couldn’t read or write official letters. Many were unable to read and write at all. Before 2003, less than 10% of villagers received a high school education. Sari Mukti is located in a relatively remote district, at least half an hour by motorbike from the town where, until 2003, the closest high schools were located. The cost of transportation, books, and uniforms meant attendance at these schools was limited to the richest children in the village. In addition to these obstacles, there were strong social expectations that after puberty, children should start working to earn money for their families. In many cases, the income provided by child agricultural laborers was vital to a family’s survival. At union meetings during the conflict, villagers asked activists to lobby the government to establish more accessible high schools so that poor children could attend school. When this approach seemed unlikely to succeed, the activists suggested that the village establish its own school, in facilities provided by the local pesantren. In 2003, the Sundanese Day-Laborers’ Union and the local villagers established the Madrasah Tsanawiah Sururon. Initially, the school occupied ramshackle buildings, with no chairs or tables, and virtually no books. Teachers used materials provided by the education department prepared for home study. Many of the teachers at the school were union activists without formal qualifications. Many themselves had only high school or junior high school certificates. In the first few years of operation, some of the volunteer teachers were themselves completing senior school certification through a home study program while they taught students in the junior school. Established in the context of the land dispute and taught by land-rights activists, the school places a strong emphasis on developing students’ abilities to organize themselves and advocate their political rights. Students are encouraged to work together in groups to solve school problems together. They conduct self-evaluations in peer groups. They are encouraged to present complaints and suggestions to their teachers and discuss them frankly. The Sundanese Day-Laborers’ Union unapologetically admits that creating such cadres is a major goal of the school. As head teacher Ridwan Syaefuddin, known as Pak Inceu, says, “The goal of the union is to produce a generation of students who can provide leadership in the village. We don’t want the students who graduate to move away to the cities to find jobs. We want them to study and then work to build up their own village.” This message is strongly indoctrinated during classes. Many of the students have responded. The first class graduated from junior high school in 2006. With the support of the union, many went on to attend senior high school in Garut. Most of these students return to Sari Mukti to serve as volunteer teachers, even while they are completing their own studies. Others are active in union and land-rights activities. Some have developed plans to create cooperatives and collectives to improve the position of other villagers. In 2008, following the success of the Madrasah Tsanawiah Sururon, an alternative Agricultural High School was established by the Sundanese Day-Laborers’ Union and local villagers to allow children to complete senior high school without traveling to Garut. Ai Anti Srimayanti takes the lead role in a class, teaching students how to write a formal letter to government authorities and other bodies. I’m proud of my school. Even though the classrooms are flimsy and makeshift, and we have more than fifty students in each class, we have our own school now. We can show the world that even though we are just poor village children, we can finish school and win our certificates. Before this school was built, practically no one went past primary school. The teachers all come from Garut or from this village. The first generation of students from this school graduated last year. Every single one of them passed their national examinations. Some of them have gone on to study at the Agricultural College in Tasik. They all come back here to teach on their holidays or when they have free time. The teachers always tell us that no one else is going to make this village a better place for us if we don’t do it ourselves. They say that even though it may be hard for us to finish school, we can do it if we try. They know it’s difficult. When we tell them we need to leave school to earn money for our families, they understand. They just tell us that we’ll be able to do more for our families if we finish school first. If we finish school, we’ll be able to come back and help bring the whole village forward. We make a promise that when we graduate, we won’t just forget about the village, we’ll come back and help the ones who are still left here. That’s why the graduates who are going on with their education come back to teach us. They made a promise. My two favorite subjects are moral education and organizational skills. Pak Inceu teaches organizational skills. He’s a very good teacher. I like the way he tells us stories about when he played in a band. He tells us how he organized a group of musicians to get the government to build a hall. He always tells us that if we try to do something by ourselves, we’ll never succeed, but if we work together as a group we can accomplish anything we want. If people work together as a group, they are much stronger than if they just work by themselves. One of the school projects involves a block of land in front of the school. We are using it to try to grow different crops. My father laughs at me and says that I don’t have to go to school to learn how to plant vegetables, but it’s different. We try crops that no one around here has tried yet, just to see if they grow or not. Maybe we’ll be able to use the project to discover new crops that make more money than tomatoes and potatoes. Maybe we’ll be able to help the village by teaching them something new. I don’t know. We’ve only just started the project and haven’t got anything to show for it yet. It doesn’t cost anything to study here. Still, it’s difficult, particularly for girls. I’m lucky. My mother encourages me to go to school. She says if I graduate, at least we’ll have one person in the family with a high school certificate. Neither she nor my father finished primary school. Some of the girls in my class have trouble. Around here, people say there’s no point in a girl getting lots of education, as she’s just going to end up in the kitchen anyway. I’m fourteen years old now. Almost all the girls that I studied with at primary school are married now. A lot of them already have a baby. Some have two babies. I’m practically the only one that isn’t married yet. I’ve got six brothers and sisters. I’m often late coming to school because I have to do all the washing and cleaning at home before I come. Sometimes my mother isn’t well, so I have to help her. If I’m late, the teachers don’t get angry. I tell them why I can’t come on time, and they understand. The teachers here aren’t like those at other schools. There isn’t a huge difference between them and us. Some of them used to be our seniors in the same school. If we tell them about our problems, they understand. The ones who are studying at college in Tasik tell us about life in the big town. When I listen to them, I want to go to college, too. I want to grow up to be like them. I want to go to college and come back here to be a teacher. You said you’re going to put my story into a book. I’d just like to say one thing to the people who read the book: Don’t look down on us just because we are poor people from the village. We can achieve just as much as people in the city if you give us the chance. 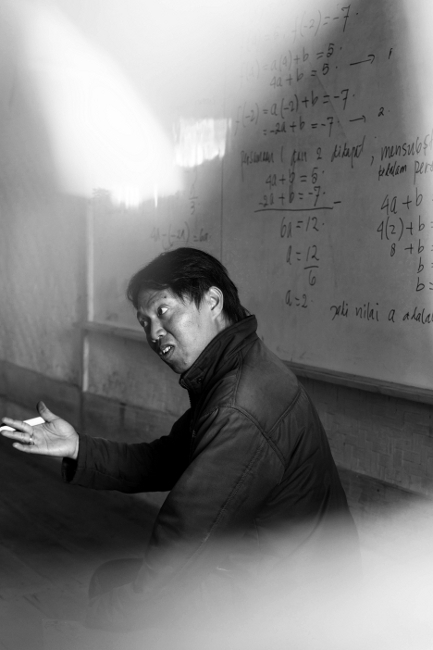 Although Inceu has no formal qualifications, he is a passionate and highly regarded teacher. Photograph by Irfan Kortschak. Copyright 2010 Irfan Kortschak / PNPM Peduli. I never thought I was going to be a teacher. My father was a primary school teacher. He wanted me to follow his footsteps, but I always told him I wanted to be an entertainer in a band. And now I’m a teacher, just like he was. When I finished high school, I joined a band. I enrolled in university, but I never attended. I just wanted to play music. I was a singer in a band in Garut. We never had anywhere to play. Even if people wanted to hold a party and hire a band, the meeting halls were too expensive for anyone here. I joined with a bunch of other musicians to lobby the local government to build a place where bands could practice and play. That was the first time I got involved in organizing people to work together to get what they wanted. In Garut I got involved with other activists. I became involved in social issues as an advocate for poor farmers. They grew vegetables on their own small plots of land or worked as agricultural day-laborers. Most of them never went past primary school. With other activists, I got involved as an advocate in land disputes. A lot of land titles around here aren’t clear, so some small farmers hold an uncertain right to their land. Sometimes land is owned by the government, but it’s been farmed for generations. I worked with an organization of poor farmers called the Sundanese Day-Laborers’ Union. One of the issues that always came up at union meetings was education. At meetings, the farmers often felt frustrated that they couldn’t read official documents and didn’t know how to deal with the government. People felt that their lack of education was an obstacle to moving forward, and they wanted something better for their children. Their lack of education made it difficult for them to organize themselves. There was hardly anyone who could play a leadership role. A few years ago, the position of village head became vacant. It stayed vacant for three years, because there’s a regulation that a village head has to have a high school certificate, and there wasn’t anyone available with that qualification. The villagers felt their lack of education as a burden. At the same time, they couldn’t afford to send their children to school in town. It was too far away, and transport cost too much. They didn’t have the money to buy their children school uniforms. They couldn’t afford to lose a strong young member of the family working on their land. Since the government wasn’t responding to the people’s needs, the union agreed to work with the community to set up a junior high school and a senior high school. In Sari Mukti, the people in the community had worked with the union before. The land uphill from the village belongs to the forestry department, but people from the village have been farming it for decades or even generations. They’ve put a lot of hard work and resources into their farms, but the title to the land is unclear. The union was involved with advocacy for the rights of the farmers on that land. During the process, the union activists got to be close to the managers of the village pesantren. The pesantren asked the union to help set up a school so that children could get their high school certificates, and offered the use of the pesantren buildings and other basic facilities. Like I said, I never thought I’d be a teacher. I don’t have any formal training in education. I wasn’t sure that I was suited to it or that I could even do it. We didn’t have any books or chairs or tables when we started. There was no money for salaries, so all the teachers were volunteers. Most of us have a high school education at most. At the beginning, in 2003, we used material from the education department’s correspondence courses. Later, we acquire a small library of books and some blackboards. We got accredited as an educational institution so we could conduct national exams here. When I began, I realized that formal qualifications aren’t the most important thing. It’s far more important that teachers have a passion to help their students. They have to work with them to encourage and inspire them. They have to be able to understand where they come from and what their problems are. The volunteers all come from the same background as the students themselves, so there’s no distance between the students and the teachers. They know we’re just the same as them. Students here feel that they can criticize their teachers. They do it respectfully, but if they have a complaint, they can bring it up at the school. We encourage the students to complain and argue with the teachers, if they have a good reason. Those are the skills we want to encourage. We want students to be able to work together to organize themselves, so if they have a problem with the school, they can present their case collectively. At the same time that the Sundanese Day-Laborers’ Union set up this school, it set up schools in two other districts. Usually, once every three months we have inter-school meetings to exchange ideas. Each school hosts the meeting in turn. Everyone goes, the teachers and the students, on trucks. The school that’s hosting the meeting usually makes an effort to show the others what they have achieved by putting on shows and holding a party. It gives teachers an opportunity to exchange ideas about teaching and accessing resources. It also builds links between the students from other areas, so they learn to work with people outside their own village. The goal of the union is to produce a generation of students who can provide leadership in the village. We don’t want the students who graduate to move away to the cities to find jobs. If that happened, the only people left in the village would be babies and old men. We want them to study and then work to build up their own village. The school opened the first grade of junior high school in 2003, so the first generation of students has just made its way through to the end of senior high school. Six of them have gone on to study at agricultural colleges and other institutions, most on full scholarships. They all come back to the village when they can. They all help teach in the school.